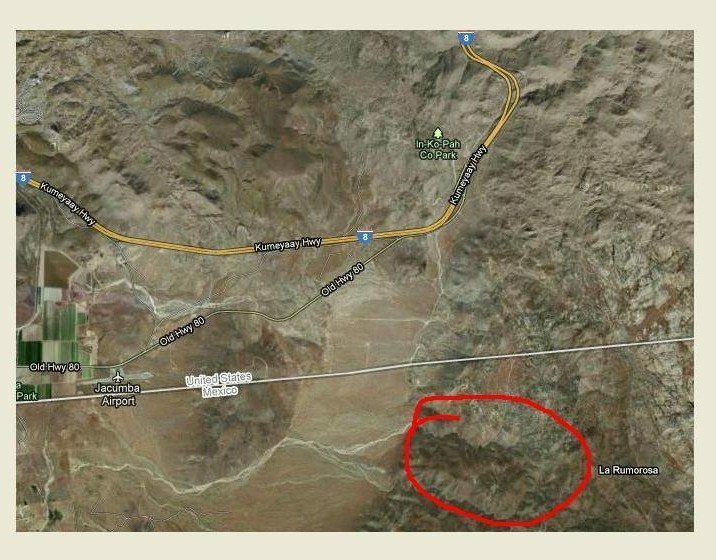 Returning from my much-ballyhooed drive out to El Centro on Tuesday – August 14th – I saw a wild fire that concerned me, but what I found out about it the next day disturbed me even more. Driving out of downtown El Centro and hitting the freeway, I saw what looked like a tan plume of dust near Ocotillo – the tiny town on the edge of the desert. Oh, great, I thought, I might have to drive through a desert dust storm. But as my rental car hurtled west on the Kumeyaay Highway with the a.c. nearly at full-blast, I could see that the dust storm was really smoke coming out of an area south of I-8 up in the mountains – not that near Ocotillo at all. As I approached the mountains and began the climb up the steep incline, it was obvious that the brown-gray-white smoke was a wild fire up in the very rugged mountains, the eastern side of the terrain – south of the freeway – . As I continued and passed the road to In-Ko-Pah County Park, the smoke just billowed away – and as I hit more level ground – the fire was directly south of me, behind the first row of hills. Wow, I thought – it had definitely grown a lot since I had driven through there earlier that day and had seen a wisp of white smoke in the same general area. It was a big, little fire, I thought to myself. I wondered how many ground crews were fighting it. I searched the air space above and around the fire looking for helicopters or aircraft dumping water, but saw none. Thinking that was curious, I continued on my ride home. The very next morning – Wednesday – I scanned the front page of the U-T for news of my “big little fire”. There in an upper left-hand corner next to the major headline of the day about the Port’s extension of its lease to Dole (which the U-T editors don’t like) was this: “Wildfires Threaten Community of Ranchita” with an inch of text and an invite to go to page B1. Next to the text was a small map. This is the map from U-T San Diego on August 14, 2012. There is no indication of my fire. 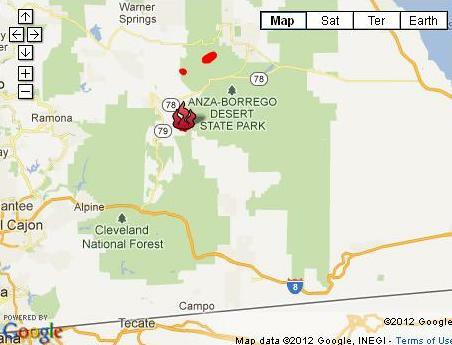 I got up closer to the map and could see little red squares where the major fires were. There was the Buck fire southeast of Hemet, the Wilson and Stewart fires southeast of Ranchita down in the desert, and the southern most fire was called the Vallecito fire. The Vallecito fire was not the fire that I had seen – it was far too north. I one I had witnessed was south of I-8. Page B1 had the real news of the fires, how the blazes were forcing evacuations of Ranchita and how 5400 acres had burned. I scanned the article and did find that Cal Fire Captain Mike Mohler had told the press that the Vallecito fire had begun about 6pm on Sunday, had burned about 520 acres southeast of Julian and “is 100 percent contained”. That’s good, I thought – it’s some relief for all the firefighters and crews fighting in this heat. The very next paragraph gave me some hope that I had found my fire. You know, when you witness a wildfire, you stake a claim on it or in it. So, because I had seen this big little fire south of 8, I was involved in it. 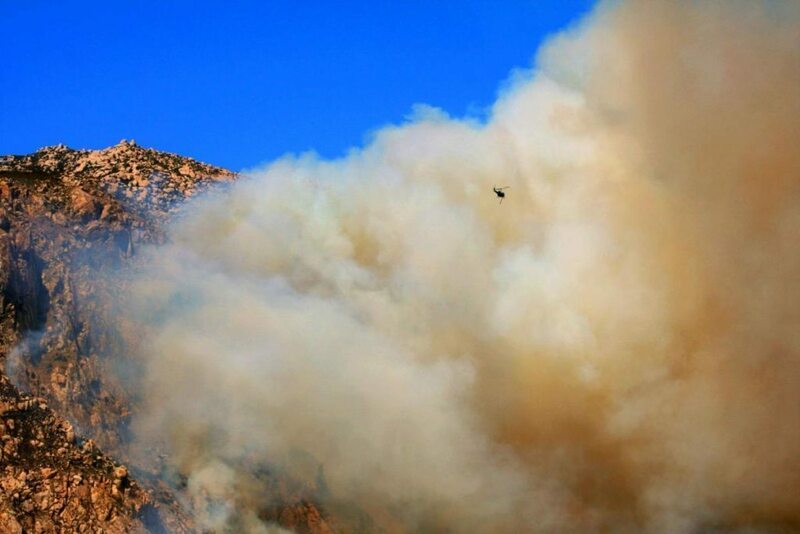 Cal Fire also responded to another blaze that began Monday afternoon and briefly spread across the border in the Copper Canyon area east of Otay Mesa. It burned about 8 acres. That can’t be it, I thought. Copper Canyon is way to the west, much closer to Otay Mesa. I then went to the U-T’s online publication, and checked out the map included in the text. Again, I did not see my fire. I stared at the computer screen and then at the paper. It dawned on me that the fire that I saw was not even in the news. So, I decided to make some phone calls. First, I checked out the Cal Fire website to look at their maps and get a contact number. Nothing on the map. A few calls later, I was told by Dottie at the local Cal Fire HQ that I needed to speak with Mike Mohler – the Public Information Officer. “Mike”, was his answer when I called him. I explained that I was with the San Diego Free Press and was inquiring about a fire seen south of 8 near the Imperial and San Diego County boundaries. Mohler was very patient with me as he ticked off the names of all the different fires that his people were fighting, the Wilson, the Stewart, Vallecito, Ranchita, Grapevine Canyon …. and I kept explaining that my fire was way south of any of those, south of I-8. We discussed how perhaps my fire was in Mexico. “There’s been 17 fires that have jumped the border since Sunday,” Mohler said. They keep an eye on them, he explained. Yet he still didn’t know anything about my fire. “Don’t know,” he finally said. “Maybe it’s in Imperial County – maybe it’s their fire.” We then hung up with his promise to call me back if he found out anything. Back to Cal Fire, Dottie told me that there is no Cal Fire in Imperial County but she gave me the number for the Imperial County Fire Department. I rang up the number – and a younger guy answered, “Imperial County Fire Department, Station One”. I explained what I was doing – trying to find out info on that fire up in the mountains south of I-8. He seemed to acknowledge that fire, but said he had to go get his captain. When Captain John came on, he explained that there were no fires in their area. He even asked his Chief who said he didn’t know about it. 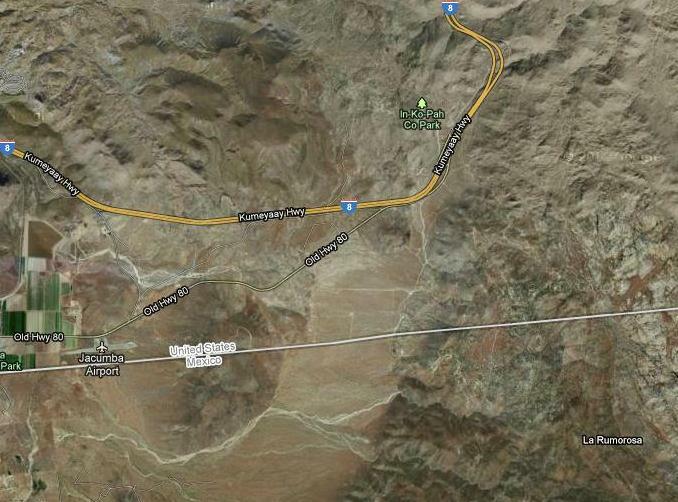 Red circle is the approximate location of the fire that I saw from I-8 on Aug. 14th at about 3 pm. Getting more puzzled with the moment, I began coming to the conclusion that the fire I had seen was indeed in Mexico. There’s a stretch of I-8, which I saw when I google mapped the border region, that gets very close to the Mexican border – maybe as close as two miles. Out there in the rugged areas that hug the border region, distances can be very deceiving, as things can look closer than they really are. Now, listen, I was not out to create problems; I just thought it extremely curious that the main Cal Fire guy did not know about this fire, and that the Imperial County fire fighters didn’t know either. I also knew from experience watching the reportage of border fires that fires in Mexico – just a few miles south of the border – are routinely under-reported by San Diego media. Yet I couldn’t understand why Mohler didn’t know about this one, especially when he told me explicitly that they carefully watch all those border fires. Even if the fire was in Mexico, it was and is so close to the border that if the winds shifted, it could have been entering the US legally or illegally, within minutes. Wind-whipped fires can cover a lot of ground quickly – just remember what happened to Scripps Ranch in 2003. And I know the men and women of the various fire fighting crews are doing their damnest to tamp these blazes down, and in this heat, the conditions are extremely unhealthy and dangerous. In my youth, I was out there fighting fires in these kind of conditions up in the hills of San Diego County. Scanning the map, I strained to figure out where my damn fire was located. The closest I could figure was that it was southeast of Jacumba – that tiny community that one reaches when they drive up from the desert. I’ll call somebody there, I thought. I tried the Jacumba airport – it’s closed except for weekends. I tried a resort – it was closed. Another hotel was a disconnected number. Geez, I thought, isn’t there anyone in this town? Then my eyes trailed east from the airport and there it was: the Jacumba Library. I called up the number and a woman answered. I explained my search, that I had seen a fire southeast of there with my own eyes and was curious about it. Oh yes, she knew exactly what I was talking about. It’s in Mexico, she explained, just a few miles away, but the wind was blowing east so the town wasn’t in any danger. “So, there is a fire,” I asked. I thanked her and hung up. Finally, someone knew what I was talking about. I had found my fire. Thank god for librarians. As to this little fire, let me check if I can find it for you in the CONAFOR or Mexican Civil Defense for you, they do not keep stats like the US, but they do, or in the Mexican press. To be fair, they are not covering ours either. Nope, sorry, your fire is MIA in the Mexican press as well. Yes for librarians. And Nadine, thanks for looking. It’s just strange that a fire so obvious to everyone around, to every driver on I-8, that officially it didn’t exist. From time to time I do call civil defense in Tijuana, and it is not that the fire does not exist… likely there were crews fighting it. We are just as bad about this. The fires this week in San Diego, they’d make it to the news because they actually threatened Ranchita. (wait, what? 20 miles or so north, north east of Julian at the most) But there are a few more incidents in California right now. Outside of CAL-Fire nobody knows, since they are in isolated areas. That area on the Mexican side is near a few Ejidos, but I am not positive. Been a while since I drove that road. I mean a couple decades. And some of those Ejidos are really, and I mean this, really isolated. So the Mexican media has little interest in covering them. Hell, the other reason why our local press is covering this (outside the usual suspects), is because, I suspect the usual suspects are covering this per usual. <—— Listening to radio traffic right now from the East County… oy. Frank – Thanks for covering this. I had the same thing happen a couple of weeks ago. It was a Tuesday night and I was driving to El Centro when I saw a huge cloud of smoke that I tracked for several miles. Finally I got off the freeway and drove south down Jewel Valley Road in the Boulevard area to determine that the fire was in or very near Mexico. I called Cal Fire for info, and they assured me there was no fire at the border. “I’m standing here looking at it,” I said. We almost always hear about Mexico fires first from our readers, not from authorities. Occasionally Cal Fire will inform us if it gets big enough for them to fight or it threatens our side of the border. But we get lots of emails from readers seeing smoke who want to know where it is. It would be a great public service if Cal Fire or somebody would track these fires south of the border and let the media know. Nadin has terrific contacts and can often get the info for us–but only if we’re tipped off that there’s a fire in the first place.